für alle die es nochmal sehen wollen!!! 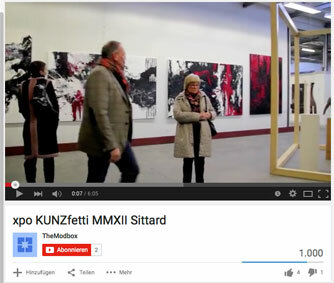 The little YouTube video that online since November 2011 for the XPO Kunzfetti MMXII has found his attention. It has cracked secretly the 1,000 visitors. Now you thinking „just“ a thousand! YES thousand art interested visitors have viewed the video on a platform for catvideos,Fails and GEMA blocked music videos!!! Thanks YouTube and THANKS all art interested visitors. You are currently browsing the Fredrik Erichsen blog archives for Juli, 2015.